Create Embellish Adore: Its a treat!!! As I mentioned before, getting myself used to using some DSP has taken me some time. I can honestly say I use it more with 3D items than I do cards. For whatever reason. I am getting better. I know I am. Its take some time. Last night I decided that I need to make some treat bags to have on hand for a "thank you","thinking of you", "you are appreciated" sort of moment. 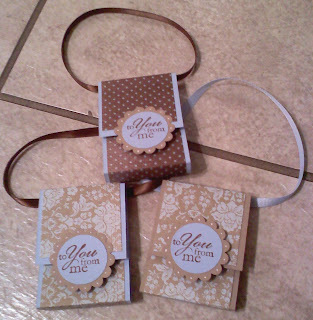 You can put a "fun size" bar in them.... customizing to the person you are giving them to! They were FUN FUN FUN and EASY!... two things I love! Again I used the retired Parisan DSP, since its alittle more masculine, in case I needed that as well. Here are the 6 I made, using the different side and coordinating colors. I love 3D items and your treat purses are so cute! Also just wanted to thank you for following my blog. 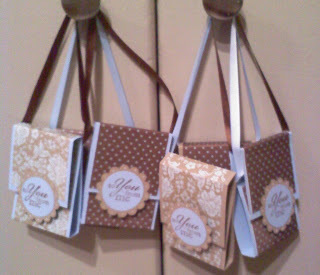 Love your project look so cute.